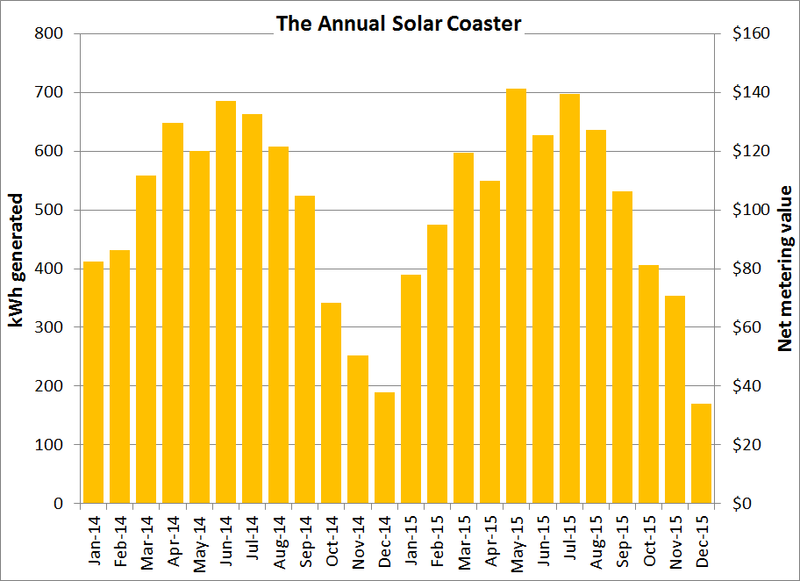 How does solar production vary over the year? Aka, take a ride on the Solar Coaster! The amount of electricity generated by a PV Tracker varies greatly from month to month. Days in December (in Vermont and New Hampshire) are much shorter than in June. In December, each day lasts only about 9 hours. In June, each day lasts more than 15¼ hours, 70 percent longer than December’s day length. In addition, weather patterns change throughout the season. These are not as reliable as the length of day, but we do tend to have cloudier weather in December which exacerbates that month’s low production. Putting those factors together, you’ll understand why the number of kWhs generated from a Tracker will be quite different at different times of year. The chart below shows the production from one of our customer’s Trackers over the years 2014 and 2015. A peak month’s production can be more than 4 times that of a minimal month, and seasonally summer is nearly twice as productive as winter. Monthly solar production and net metering value from a Solaflect PV Tracker, 2014 – 2015. Many customers build up credit with the utility during the summer and use this credit to help offset winter electric bills.